The South Dakota State Senate sent to Gov. Dennis Daugaard on Tuesday legislation that would enable discrimination against transgender students in public schools. If the governor signs the bill, South Dakota would be the first in the nation to enact an anti-trans “papers to pee” law. The bill, HB 1008, would prohibit transgender students in public schools from using the public restroom consistent with their gender identity. The legislation, known colloquially as the “papers to pee” bill, says schools must provide transgender students with a “reasonable accommodation,” although it can’t be a shared facility, such as a locker room or public restroom. By a vote of 20-15, the Senate voted to approved House Bill 1008, which the House already approved by a vote of 58-10. It’s unclear what action Daugaard will take on the legislation. For weeks, his office hasn’t responded to multiple requests from the Washington Blade for his position on the legislation and whether he would sign or veto it. 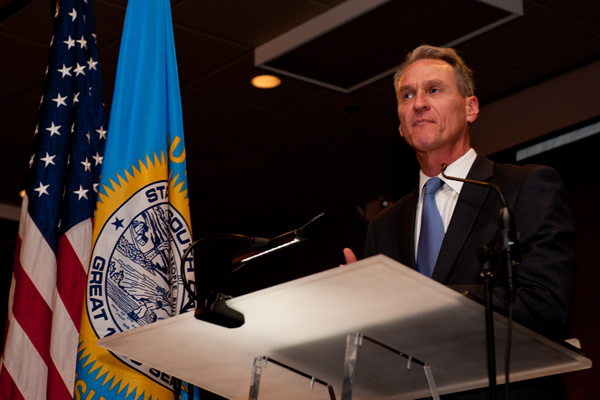 In February 2016, Daugaard said during a news conference he has never met a transgender person and wouldn’t make a commitment on the legislation. Alternatively, if he were inclined to veto it but didn’t want to take that step publicly, Daugaard could ask the legislature to go back and work on it. According to a source familiar with the South Dakota legislative process, that process occurred only once last year. The South Dakota Senate approved the legislation after an hour of debate in which defenders of the bill said it would protect children and opponents said it would stigmatize the state. Critics also said the legislation would open up South Dakota to potential lawsuits and conflict with the federal government, which has determined transgender students are protected from discrimination under Title IX of the Education Amendments of 1972. State Sen. Brock Greenfield (R-Clark), the prime sponsor of the legislation, said the legislation is needed to prevent children from being exposed to the genitalia of individuals of different biological gender. State Sen. Angie Buhl O’Donnell (D-Sioux Falls) said HB1008 takes the decision out of public schools’ hands and “endangers transgender students,” taking note of potential litigation against the state that could jeopardize the $200 million in funds the state receives under Title IX. Buhl O’Donnell said if the bill were about privacy, the legislation would have a provision enabling students who have an objection to transgender youth to request a private stall or courtesy curtain. “Maybe this bill was not intended to be disrespectful, but I would submit, if someone — a whole community of people tells us that we are hurting them, who are we to decide that we didn’t?” Buhl O’Donnell said. Two amendments proposed by Democrats aimed at mitigating the effects of the legislation were defeated in the Senate. One amendment proposed by State Sen. Troy Heinert (D-Mission) would have changed the requirement schools remove transgender students from public restrooms to simply allowing the schools to take that course of action. His amendment was defeated by voice vote. State Sen. Bernie Hunhoff (D-Yankton) proposed an amendment that would have ensured the state, not schools, bear the costs of litigation resulting from the law and would have created a transgender legal defense fund to ensure the money is available. His amendment was defeated by a standing vote of senators. Chad Griffin, president of the Human Rights Campaign, urged Daugaard to veto the legislation and to meet with transgender constituents who would be affected by the measure. Although in previous years anti-LGBT “religious freedom” measures were derailed in Arizona, Arkansas and Indiana after outcry in the business community, that same level of outcry wasn’t present in South Dakota. The South Dakota Chamber of Commerce didn’t respond to the Washington Blade’s request for comment on Friday about the anti-trans legislation. Also not responding to requests for comment on the bill were major employers in South Dakota: Citibank, which operates its headquarters in Sioux Falls, and Tyson Foods, which operates Tyson Fresh Meats out of Dakota Dunes. Cindy Morrison, executive vice president of Sanford Health, a major medical facility based in Sioux Falls, S.D., said Sanford Health has no position on the bill. Last week, a White House official declined to comment on HB1008 in response to an inquiry from the Washington Blade. Yet to publicly oppose the legislation is the presidential campaigns of Hillary Clinton and Bernard Sanders. The Blade has placed requests in with those campaigns seeking comment. Kris Hayashi, executive director of the San Francisco-based Transgender Law Center, called for a veto on the basis the bill would endanger both South Dakota and transgender students. In South Dakota, HB 1008 is but one anti-LGBT bill pending before the legislature, although it’s the furthest along in the process. Another bill is HB 1007, a religious freedom bill seen to enable anti-LGBT discrimination. Yet another, HB 1112, would ban any transgender-inclusive policies in South Dakota schools. They should prevent the South Dakota State Senate from using the restroom. Small minded bigots. So – you’re slurring six year old prepubescent girls as porny men? And what does it matter if they wear jeans, a skort or a dress? You have some sort of sartorial fetish? How does a man parade naked while wearing a dress? Please advise. No – seriously – answer the questions – why do you hate 6 year old trans girls? What’s in it for you to want to hurt them? And – when did you become the spokeswomen for women?